An outstanding value. Exclusive balance lever that can't drop down to pinch your fingers. Unlimited hand clearance that only a "C" frame can offer. Works equally well with the right or left hand. Even if you already own a press, an extra press is always useful for decapping, bullet seating or bullet sizing. Accepts standard 7/8 x14 thread dies and standard Universal Press Shell Holders. Now features Lee Breech Lock feature. 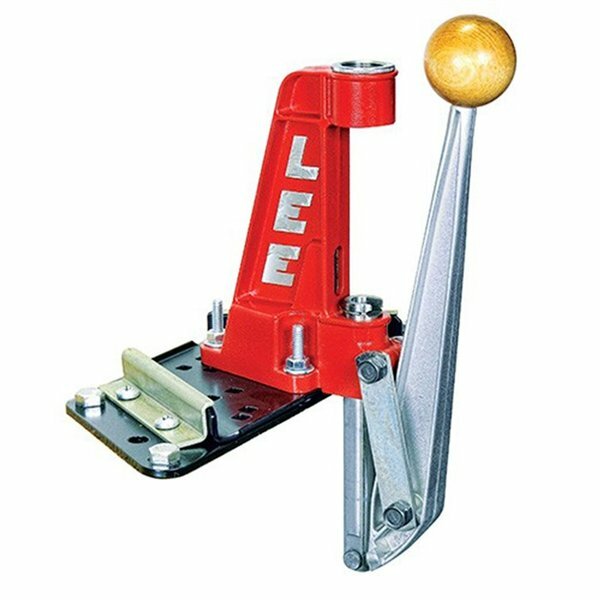 Shown mounted to the Lee Bench Plate system, sold as an accessory. En enestående verdi. Eksklusive balanse spak som ikke kan trekkes ned for å knipe fingrene. Ubegrenset hånd klaring som bare en "C" ramme kan tilby. Fungerer like godt med høyre eller venstre. Selv om du allerede har et trykk, er et ekstra Trykk alltid nyttig for decapping, bullet sitteplasser eller punkt størrelse. Godtar standard 7/8 x14 tråd dør og standard universell trykk skall holdere. Nå har Lee Breech lås ansiktstrekk. Vist montert til Lee benk Plate system, solgt som tilbehør. DO NOT BUY THIS PIECE O GARBAGE. It is made of pot metal, I bought one looking for a single stager for more precise loading and after the 4th 223 shell put in to size and de-prime the metal where it was bolted down in the back snapped making it a useless boat anchor! This little press is a dandy for the money. It is best used for a deprime station, bullet seating and pistol and small rifle press. I've had mine for several years without a problem. It's a bit rough around the edge but it's a small inexpensive press. For fun, I loaded some 357 Magnum rounds and I couldn't tell the difference between the targets made with my more expensive LEE Classic Cast Press. Buy it and use it as stated above. I use this press strictly for depriming fired cases. teamed with the Lee depriming die, it makes a great inexpensive combo. ram goes up perfectly straight, i check every seated bullet on my concentricity gauge and its dead on half a thousand, I reloaded over 1,300 rounds 7mm Rem Mag on this press held up strong for 14 years so far and I love it. I bought this because it was cheap ... boy, was it ever! After less than a month the arm broke in half while trying to resize a rifle case. I learned my lesson, quality is not cheap but this "press" is. I've had mine for about 5 years now. Well, I had one, and was resizing some large cases that weren't lubed enough and broke the mount off because I was pulling it way too hard. But Lee replaced it for free when I sent in pictures. I actually love this thing because of the "C" shape, which gives you extra room to work, and it's shorter length handle. It takes very little movement to load when comparing to the classic model. I prefer this one by far. I've loaded everything from precision 6.5 Creedmoor rounds down to 9mm hollow points with this thing. Can handle them all with ease. Highly recommended. Produsentnr. : 90045 734307900458 En enestående verdi. Eksklusive balanse spak som ikke kan trekkes ned for å knipe fingrene. Ubegrenset hånd klaring som bare en "C" ramme kan tilby. Fungerer like godt med høyre eller venstre. Selv om du allerede har et trykk, er et ekstra Trykk alltid nyttig for decapping, bullet sitteplasser eller punkt størrelse. Godtar standard 7/8 x14 tråd dør og standard universell trykk skall holdere. Nå har Lee Breech lås ansiktstrekk. Vist montert til Lee benk Plate system, solgt som tilbehør.